Pay 1000 Life Points. Special Summon 1 Ritual Monster from your hand. The Ritual Monster Special Summoned by this effect cannot attack, and is destroyed during the End Phase. Only 1 "Ritual Foregone" can be activated per turn. This is the Ritual version of Instant Fusion. This card doesn't perform a proper summon, but Instant Fusion does (Ritual and Fusion Summon respectively). This card can summon a monster of any Level, but Instant Fusion only summons Level 5 or lower. Shinato, King of a Higher Plane appears in this card's artwork. From a closer look, the figure appearing here also resembles The Agent of Judgment - Saturn, but with three pairs of arms and wings. If the Ritual Monster Special Summoned by the effect of "Ritual Foregone" is not destroyed during the End Phase, it continues to remain face-up on the field but unable to declare an attack. Furthermore, during the opponent's End Phase, the condition to destroy itself will be applied again. : If a Ritual Monster that is Special Summoned with the effect of "Ritual Foregone" is not destroyed during the End Phase does it continue to remain face-up on the field? If a non-effect Ritual or Fusion Monster is Special Summoned by the effect of "Ritual Foregone"/"Instant Fusion" when "Non-Spellcasting Area: If "Non-Spellcasting Area" is applied to the field, will a monster Special Summoned by "Ritual Foregone" or "Instant Fusion" be destroyed? 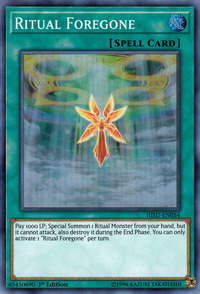 If the Ritual Monster Special Summoned by "Ritual Foregone" is flipped face-down or is removed from play (even temporarily), the effects of "Ritual Foregone" are not applied. So the monster can attack this turn, and is not destroyed at the end of this turn. Even if "Non-Spellcasting Area" is active, a Ritual Monster that is not an Effect Monster (such as "Hungry Burger") will still be affected by the restrictions on "Ritual Foregone". So it still cannot attack and it is still destroyed at the end of this turn. If "Destiny Hero - Diamond Dude" uses its effect and reveals "Ritual Foregone", you can still activate another "Ritual Foregone" that same turn.